I'm just learning about using the class and update method to effectively multitask different led strips on unique pin assignments. Is there a way to multitask half of a neopixel strip to do one thing like blink steady while the other half does a knight rider fill? Yes! I've written a library that does exactly that. But no one ever seems to understand the code I write. first class is a neoPixel group. Lets say its a 12 pixel ring, or a 8 pixel strip. In these group classes you program as if they are the only pixels on the pin. Now all your sections run independently of each other. Well it looks to the humans as independent. And your coding as if it was. In reality is still just one long string. I haven't seen Jim's code, but what he describes sounds like a good way to approach it. On the one hand, you have a class to represent one or more physical strips, rings, sticks etc. that each need to be addressed serially. And then you have class to define one or more logical groups of pixels that you want to map onto the physical groups. Woud you like to see it? Yes, I would like to see it. Navigating a library might be another new learning task for me, but I'll explore it if I need to. Based on this learning article, https://learn.adafruit.com/multi-tasking-the-arduino-part-3/overview, I was thinking I could pull this off from within my Arduino IDE sketch. 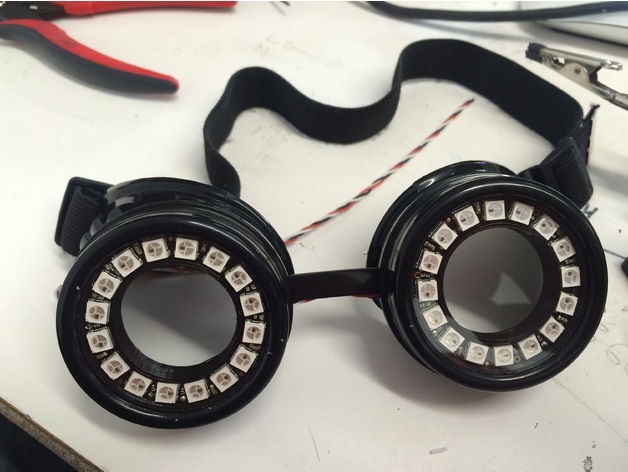 This is code for my pair of goggles with neoPixel rings built into them. The version I'm posting has a rasta-ring circling around each one. setUpPattern(); // First is to set up the pattern we want. Here are the two ring classes.. If you want to try using this, you're going to have to grab ... Hmm.. two folders off my github to support this environment. https://github.com/leftCoast/Arduino/tree/master/libraries <- This is my libraries folder. LC_baseTools <- The basic toolkit all my stuff relies on. You'll need this. LC_NeoPixel <- My neopixel library. My simplified neoPixel interface, chain pixels and what have you. This uses coloObj to do the color stuff. That comes in LC_baseTools it makes doing custom color stuff a LOT easier. NOTE: The version of the neoPixel library you see there only works for the original RGB neoPixels. It needs a hack to run with the RGBW version. Gool luck, let me know if you can get this working. I tried it as best as I could, I really am a light year behind you, so it might take some time to catch up. I downloaded all of those .h, .cpp, and .ino files to my ../Arduino/libraries directory and then opened goggle_lights.ino and ran verify. Arduino: 1.8.8 (Windows Store 1.8.19.0) (Windows 10), Board: "Adafruit Trinket M0"
Wouldn't the Adafruit_NeoPixel.h library be sufficient for me to define a class and 2 classes within that class as you have described? And then be able to execute the 2 animations on one strip simultaneously? *Define the class and 2 subclasses in my .ino file that is? Wait a second, you only needed to d-load the two folders I said, Not the Arduino entire library folder. There is a TON of stuff in that github repository you don't want cluttering up your life. Did you only grab those two? Or possible are you now swimming in source code files? Something really odd going on here. theRings.cpp is only 70 lines long. You're getting errors on line 200 and some? Can you copy paste that file to the forum here? Interim problem found--the contents of the files I downloaded are html. I usually get email alerts for a post update, guess I missed this one. Reasonably certain I have only downloaded the two specified folders. There should be a big green button for downloading. Sorry, I never have been able to understand the thinking behind most of github. Success! Thanks for all your time on this. I now have 32 pixels running a white-red-green pattern on pin 3 of my Trinket M0. (running the goggle_lights.ino (with only one character modification). 1. Where do I change the pin assignment(s)? 2. Where is the pattern defined (aka where is it called from within the .ino)? When you create the pixel chain, its only parameter is the pin#. When you create your groups you specify how many LEDs in each group. The .h file is where you can look see how to create them and what kind of goodies they have for you. // are wired in daisy chain fashion. This is beyond handy. // You program each pixelGroup as if it was the only thing on the chain. // up on one daisy chain data line. // added an instance of the same object four times. colorObj getPixelColor(word pixelNum); // What color is THIS pixel now? void setPixelColor(word pixelNum, colorObj* color); // Set THIS pixel this color. void setPixels(colorObj* color); // Set ALL our pixles this color. colorObj shiftPixels(bool toEnd=true); // Even handier! virtual void draw(void); // This will be called repeatedly. Yes, I'm beginning to unpack this in my mind. 3. QUESTION: so if I added theRings.addGroup(&ring3); , I would get a 3rd region of 16 pixels ie. the next 16 in a chain of neopixels wired end to end? Not specifically numbered, just the next available? Convenient if so, I have two strips of 48 pixels each on pins 3 and 4 currently. 4. chainPixels theRings(3); //this line is where chainPixels.h is invoked to define the pixels as on pin 3--not sure what the "theRings" prefix does. I did see the readme file and I am part way through that. However, I changed (3) to (4) and nothing happened. Maybe I need to double check my hookup or my logic of the pin assigment is off. Will have to finish tomorrow morning, God willing, I've got to rest and pack a lunch before running off to a swing shift that runs past midnight. Ok, you're getting it. This is going to take some explaining so here's a bit you can chew on next time you're through here looking. QUESTION: so if I added theRings.addGroup(&ring3); , I would get a 3rd region of 16 pixels ie. the next 16 in a chain of neopixels wired end to end? YES! You got that bit correctly! In c++ you inherit general purpose classes, add your own twist to them to make custom things (classes). A "class" is just the template for a type of object. An object is almost like a tiny subprogram of its own. When I added the two rings to the chain pixel thing, I added objects, not classes. The .h & .cpp files describe how they work and how to run them. Its the objects you create that actually do these fun things. I gave you pixelGroup as a general purpose class. pixelGroup doesn't actually draw anything. BUT, it knows all about the chainPixels class. Them two are partners. Everything about how to add to the list, addressing lights etc. Is handled by them behind the scenes. In my example I made (2) derived classes. starLight & portLight each "inherited" pixelGroup or in other words were derived from pixelGroup. Ok, you need to write a class for each type of pattern you want to show. This is now a lot easier because, white writing it, you don't have to worry about anything else. Other patterns, timing addressing what have you. Each of your pattern class's will have its own draw() method you fill out to do your drawing. In your setup() function, or maybe even before, you will create new objects from your classes and add these objects to your chiainPixel objects. If you only want one pattern three times, you only need to write one class and use that class to create three objects to add to your chainPixel object. A lot to chew on? Here's something different.. In the example setup() method what's going on is I am creating colors and adding them into a multi color mapper. Color mapper? Color mappers allow you to order colors by number. Any number. For example you want a temp gauge that shows color with temp. 0C - 100C is good. So you add 0,green 100,green. Now say 100C-120C, not so good but ok.. add 105,yellow, 120,yellow anything over 150C is overheating 150,red. Then you can pop in a number and it will give back a color. If the number is between 0->100 you get green 105-120 yellow 150+ red. Between these say.. 135? You'll get something like orange. Color mappers blend between set points. Want a line of pixels that fade to black? Start a mapper at one end of your color and the other at black. Color multi mappers? You add as many color as you want at whatever value you want. The as you map values into it a veritable rainbow come out. Enough for now. You can chew on that for a bit.